I posted these thoughts as a facebook status update a week ago. I’ve been amazed by the tremendous response that these words have received. I share these words here on this site to give them a more permanent home. 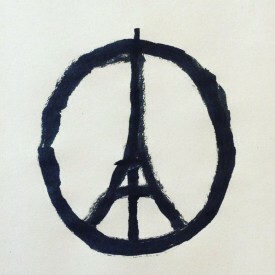 My heart aches for Paris. Judging by my facebook news feed, I’m not alone. This tragedy in Paris has captured our attention and left us stunned and saddened. There is something in the Western psyche that loves Paris. It is, after all, the city of love. Paris speaks to our hearts and to our imaginations. It speaks to our longing for connection, to our desire for love’s enchantment, and to our yearning to blur the lines between self and other. Paris is the place of midnight strolls and moonlit giggles, drunk on the wine of love. It’s the place of possibilities and dreams. But on that November night, the dream became a nightmare. The bottles turned to bullets. “Bonbons” to bombs. “Amour” to armor. The streets were drenched in blood. Miles away, I try to make sense of this event. I recognize that these tragic events took place in the wake of bombings in Lebanon and amid atrocities in many parts of the world. There is ongoing war in Syria, with ongoing airstrikes and bloodshed. Parisian life is no more precious than any other life. The spilling of blood is horrific, no matter what continent it’s on or what borders it’s within. I’m not immune to this type of thinking. This story of separation shows up in the way I interact with others. I fear the unknown and I build barriers against “the other.” Often I’m not even aware of it. What barriers to love exist within me? What prejudices lurk in the shadows? What beliefs have built walls between myself and those I see as different? Where do I let my fear of the unknown contract my heart and close me to the opportunity for connection? Pondering these barriers, I’m reminded of an overnight train ride from Paris to Madrid that I took ten years ago. I took a seat beside a man who was about my age. His skin was darker than mine. I sat down beside him and took out my book. I ignored this man as though a plexiglass barrier separated us. With a warm smile, he reached out his hand and introduced himself. This small gesture of human kindness sparked a conversation that would last for hours. As it turned out, we had much in common. We were both on our way home. He was going to Morocco; I was going to the US. We both had been raised in families with a strong tradition of spiritual practice—he was raised Muslim, I was raised Christian. We were both one of seven children in our families. We both had been living in France. We both had partners who were newly pregnant. We were both scared out of our minds to become fathers! We talked all night about the joy and fear we felt as we transitioned into the next stage in our lives. We talked about the responsibility we felt as we brought a child into this world. We shared our hopes for our children and our families. When we reached Madrid, we said warm goodbyes and we never spoke again. Today I pray for him. I pray for his safety. I pray for his family. I pray for his partner and for his child who is the same age as my daughter. I pray for the world that our children are growing up in. I pray that this man continues to break down barriers the way he broke down the barrier with me. By extending a hand of friendship and by sharing his story, he taught me a lesson in love. I pray that I can be like him—that I can break down barriers to love. Beginning within myself. My wife and I have created a FREE guided meditation program to help you cultivate peace, compassion, acceptance and love during the holiday season. When you register, you’ll receive a free guided meditation each day from December 1 through December 25.